For Hector Varela, slow-cooking a brisket over a mesquite wood fire with family and friends is more than just a casual backyard activity. 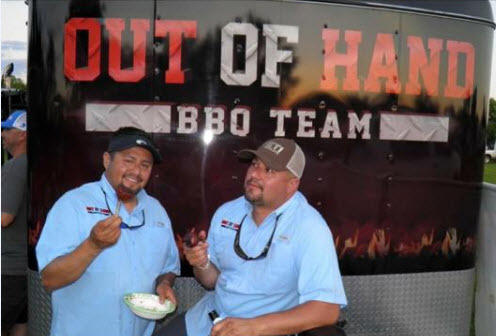 Varela and teammates from the Out of Hand BBQ team take their grill skills on the road to compete in barbecue cook-offs across South Texas. The team has proven their skills in competition for nearly a decade. The passion to compete in barbecue cook-offs started as a family affair. With the help of family and friends, Hector and his brother, Norman, honed their skills well enough to get sponsored by Holt Cat. But after seven years, Out of Hand BBQ branched out on its own to compete. In 2014, the team won fifth place out of 280 teams at the San Antonio Stock Show & Rodeo. The team also got third place for its ribs at the TylerQue Throw Down in nearby Kirby. One of the awards the team is most proud of is the People’s Choice Award at last year’s inaugural GrillsGiving. Varela, with coworkers Daniel Jimenez and Jon Ransleben, competed against fellow employees and other aspiring pitmasters. During the competition, the team had to overcome rainy, cold weather to get the top spot. During the competition, teams are tasked with preparing at least 250 tasting samples for attendees. The team with the most tasting votes is declared the winner. This Saturday, the Out of Hand BBQ team will compete against other CPS Energy and community teams at our second annual GrillsGiving event at Mission County Park. About 30 teams will serve up samples of their prized smoked meats for judges and attendees to try. Varela said his team will be ready to serve up some savory ribs, chicken and brisket covered in their own special ingredients. The team plans to win the People’s Choice Award again this year with their sampler plate of pulled pork sliders with pickles, onions and a side of beans. The team loves to compete, but they also enjoy using their skills for a good cause. Net proceeds from GrillsGiving benefit REAP (Residential Energy Assistance Partnership), which helps to pay energy bills for customers who qualify for assistance. Varela said his team has done several barbecue benefits for people who have either lost loved ones or are battling cancer. One thing that really inspires Varela is seeing younger co-workers and friends using their love for barbecuing to motivate them to do well in life. Much like Hector sees potential in younger generations learning to hone their barbecue skills, he sees great potential for GrillsGiving expanding its influence in the community. Come hungry this Saturday! GrillsGiving runs from noon to 6 p.m. There will be plenty of Texas flavor and Texas music. Discount tickets can be purchased online through Friday. 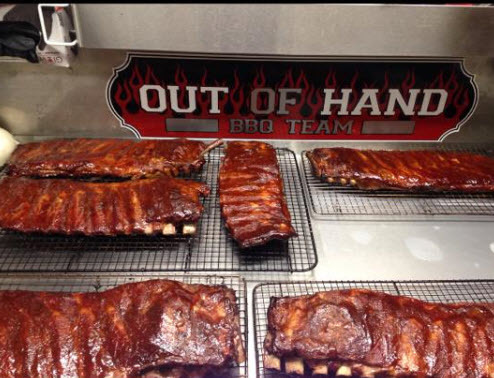 Just passed out of hand BBQ team heading to Helotes saw the picture of the ribs now I’m hungry for one.